3 – The Letter “E” appears in odd numbers. You cannot use the letter “E”. 5 – Write the moment you decide to cut a corner. 7 – Write the senses – we have 5, is there a 6th? Your scene: the backyard of your childhood home. 8 – Rest. In music, in bed, in the space of a poem. 9 – Your poem is a gift, wrap it in colorful paper, bows, confetti. What’s inside? Tell us. 10 – This algae bloom. 11 – On this day, Napoleon abdicated, 1814. You can find more here. Connect your words with something that happened on this day. 13 – Listen to your favorite song until you cannot hear the melody anymore, until the words are meaningless. Then, write a poem about that experience. 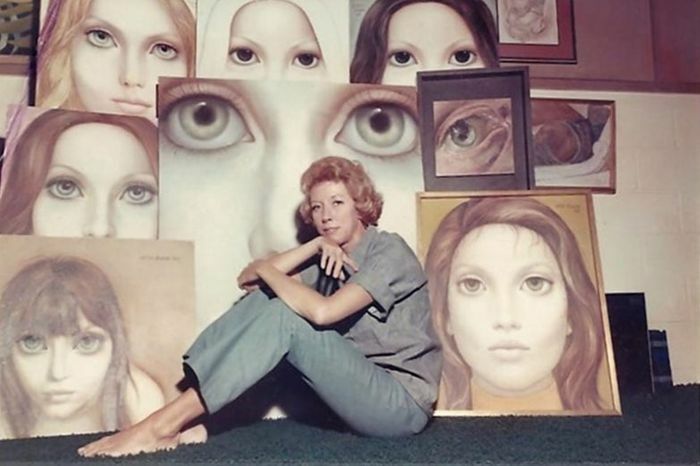 15 – Write about Margaret Keane. 16 – Write a sonnet. 17 – Silence. It has a sound, a feeling, a space. I want to know about it. Tell me about your silence. 18 – Visit the Smithsonian’s website for the National Portrait Gallery. Find a face and write their poem. 19 – Write a crocus, snowbell, daffodil, or lilac poem. 20 – Columbine was 20 years ago. Google the shooting and write your thoughts. Don’t approach this as a poem, more like a meditation. 21 – Write about the color green. 22 – 22 lines about anything. 23 – Listen to Clair de Lune and tell me what it’s really about. I have three poems up at Nice Cage in Issue 007! Please head there and take a read. Additionally, I have a poem nominated for a Pushcart Prize! “Last Note Slipped Under the Mattress” in Gordon Square Review, Issue 2. If you haven’t already, you can read it here! And that poem, as well as “The Pyre” in sidereal magazine are nominated for Best of Net 2018! My debut micro-chapbook, SPACE SPECTACULAR, is out today from Ghost City Press! The chap is free on their website, and any donations you make will come directly to me. SPACE SPECTACULAR is a collection of poems that enact a sort of call and response between Earth and Space. Some of the poems suppose what happens outside of our galaxy and some call out to other planets in our solar system. It was an incredible experience to research and write these poems, many of which appear in my longer manuscript, STAR FACTORY, which is currently looking for a home. Thank you to the wonderful editors at Ghost City Press and to all my current and future readers. SPACE SPECTACULAR print version available! I am happy to announce that after a year of adventure in North Carolina, I will be returning to Ohio. Cleveland and the whole state of Ohio hold a very special place in my heart, so I am grateful to be returning HOME and to the amazing literary communities that Ohio has to offer. Go check out my poem “Bird With A Broken Wing,” which appears in the new issue of Red Queen Literary Magazine. And look for my debut chapbook, SPACE SPECTACULAR, from Ghost City Press this July. So very happy to update you with three bits of good news! (1) On May 15, I will be reading at the Gordon Square Review Issue 2 Launch Party. My poem “Last Note Slipped Under the Mattress” will be in that issue. (3) Ghost City Press is releasing my micro-chapbook, SPACE SPECTACULAR, as part of their 2018 Summer Micro-Chapbook Series. I am so overjoyed to have these poems in the world and I cannot wait to share the link with you so you can snag a copy!